I’m always on the lookout for affordable Walla Walla wines. Generally, I find them to be an intense, yet easy drinking glass filled with fruit, earthiness and a touch of bright acidity. When I caught sight of The Manhattan Project Cabernet Sauvignon 2008 with its super budget friendly price, I snatched it up in a jiffy. Even though the label provided me with fun facts about the soil and tasting notes of the wine, it didn’t dispense any information about the winery or grape percentages used. After trawling about on the web, I discovered that this is another bottle where the winemaker and source of the grapes are kept top secret. Recently these types of bottles have been the result of a combination of a fantastic harvest in a high-end vineyard and the soft economy. Wineries know they won’t be able to sell all of their higher price point bottles, so they sell the surplus grapes [and sometimes even the already blended wine] to another producer that will bottle and sell it under a different label with a much lower price. As wine drinkers, we are the direct beneficiaries of these classified operations. Deep dark garnet with occasional ruby highlights in colour, after aerating aromas of earthy damp leaves and herbaceous anise rose from my glass. Concentrated black cherry and blackberry flavours softened up the mouth puckering acidity in the medium to full body. Spicy black pepper mingled with zippy licorice and bitter dark chocolate in the lengthy finish, whilst a lovely cherry note lingered between each sip. Rustic and dry, enjoying with a meal will coax out the delightful fruit and warm spice elements, and produce a very easy drinking glass. Thanks for the great review! 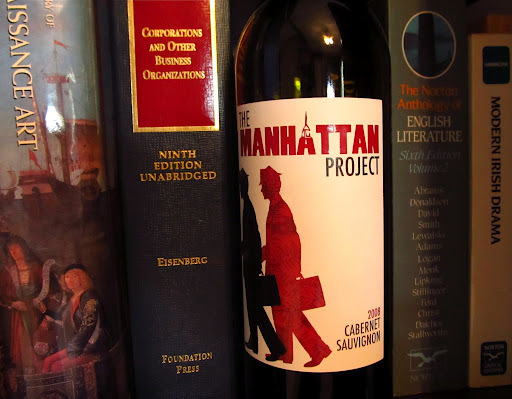 Check us out at http://www.facebook.com/TheManhattanProjectWineAlso, the blend is a top secret bourdeax blend heavy on the Caberet Sauvignon.